Build Your Business Website Today..... The SBI Way! Perhaps you would like to know how my SBI website began! 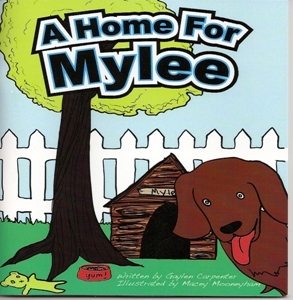 I had written a Christian children's book entitled, "A Home For Mylee." I worked hard to find ways to promote it, but soon ran out of inexpensive promotion ideas. I worked with wonderful people who helped to make "A Home For Mylee" quite a success at the local level! I was encouraged by all those who bought the book. The successful sale of "Mylee" prompted me to work even harder with promoting the book. In the spring, our local newspaper printed information about a Small Business Expo. I clipped the article and kept it for weeks. The day of the Expo finally came. However, it was so rainy and cold that day, I decided not to go! As I began my day,I felt this "nudge" in my spirit. It was as if God was telling me to go. I listened to my inner voice and headed to the Expo. I walked inside the building where the Expo was being held. I visited several tables and talked to some professionals about their small businesses! I hoped I would find new insight on how to promote "A Home For mylee." I had made it about half way around the Expo when I came upon a seminar that was scheduled to start soon. I sat down to see what it was about! As I look back, I realize now it was one of the best decisions I have ever made! SBI HAS CHANGED MY LIFE! Mercedes Campbell is a wonderful instructor! She is patient and kind! She gave me the confidence I needed to succeed! Since she has several websites of her own, she is very knowledgeable! My website building class day is the best day of the week! I enrolled in the morning class, so I could start early, go by Hardees for a Bacon/Egg biscuit, and wash it down with a YooHoo chocolate drink! I can't wait to get to class and see my classmates! It's because we've all become best friends! We're so excited about our website businesses! Most of us are amatures, however this "one of a kind" software gave us just the right tools to make us professional "infopreneur" in no time at all! SBI WILL DO THE SAME FOR YOU! 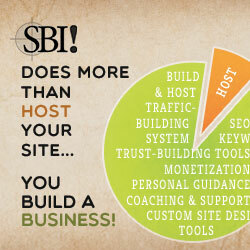 The best way to build a business website really is the Solo Build It way! The Solo Build It folks are webmaster "experts" who lead you step by step in everything you need to know for a successful website business! It's time to get out of the "rat race" and do something you love! Turn your hobby, or passion into Internet success! You CAN do it, and Solo Build It will show you how - one step at a time!